All I need is a healthy ovum and I can grow my own Leonard Nimoy! 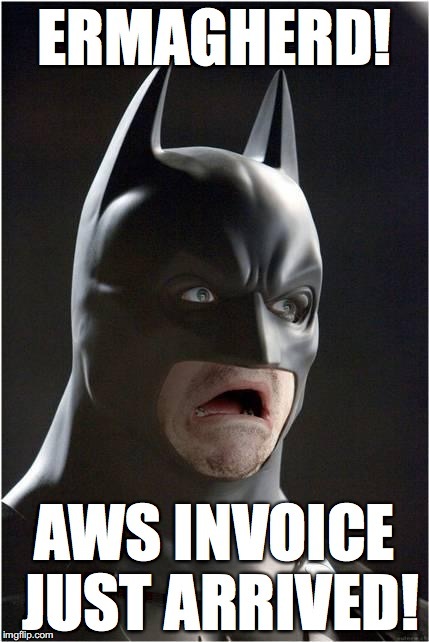 Continuing in this series of blog posts taking a bit of a “warts and all” view of a few Amazon AWS features, below are a handful more tips and gotchas when designing and implementing solutions on Amazon AWS, including Dedicated VPCs. Just a quick one this week, specifically something to watch out for otherwise you risk running up a scary bill very quickly! Now here’s the rub… if you select dedicated VPC, this will actually cause every single EC2 instance from then on to be created on dedicated hardware (what AWS call single-tenant hardware, i.e. dedicated physical servers!) by default, within that VPC. Also note that as per the Dedicated Instances KB article, “You can’t change the instance tenancy of a VPC after you create it”. In other words, if you find you have created your VPC as a dedicated one, you will have to destroy and re-create everything within that VPC to get it back to default (i.e. multi-tenant/shared compute). 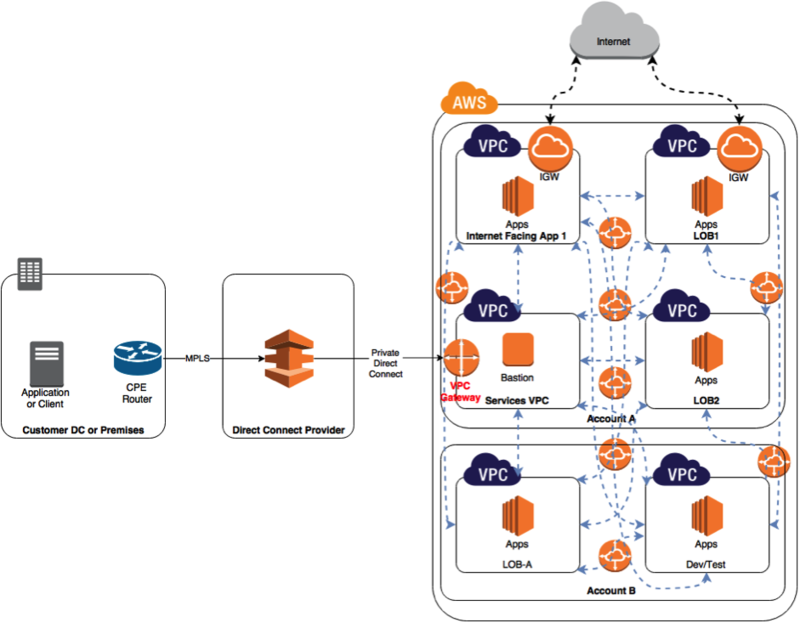 Continuing in this series of blog posts taking a bit of a “warts and all” view of a few Amazon AWS features, below are a handful more tips and gotchas when designing and implementing solutions on Amazon AWS, based around VPCs and VPC design. Following on from the previous post, let us assume that instead of just talking about public services endpoints (e.g. S3, Glacier, etc), and instead we are talking about environments with multiple VPCs, possibly multiple accounts, and the potential addition of Direct Connect on top. The simplest answer to this is so that you can avoid being “CodeSpaced” by keeping copies of your data / backups in a second account with separate credentials! Separation of applications which have no direct interaction, or perhaps minimal dependencies, to improve security. Running separate applications for different business units in their own accounts to make for easier LoB billing. Allowing different development teams to securely work on their own applications without risking impact to any other applications or data. With the mergers and acquisitions growth strategy which many companies adopt, it is fairly common these days for companies to be picked up and bring their AWS accounts and resources with them. Lastly, a very common design pattern for compliance is to use a separate account to gather all of your CloudTrail and other audit logs in a single account, inaccessible to anyone except your security team, and therefore secure from tampering. The great thing is that with consolidated billing, you can have as many accounts as you like whilst still receiving a single monthly bill for your organisation! We will now look at a few examples of ways to hang together your VPCs and accounts, and in the majority of cases, you can effectively consider the two as interchangeable in so far as the scope of this post. This option is ok for small solutions but definitely does NOT scale and is also against best practice recommendations from AWS. As mentioned in the previous section, transitive peering is also not possible unless you are somehow proxying the connections, so if you are looking to add Direct Connect to this configuration, this just simply isn’t going to fly. 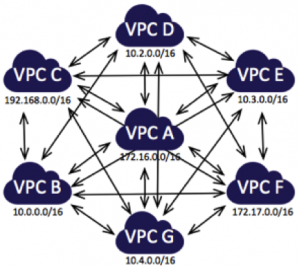 Imagine that all of the blue dotted arrows in the following diagram were VPC peering connections! Aaaaargh! In this example, you could push a Direct Connect VIF into VPC A and via your bastion server, manage servers in each of your other VPCs. This would NOT be appropriate if your other servers / clients on premises wanted to access those resources directly, however, and is more likely in the scenario where each VPC hosts some form of production or dev/test platform which is internet facing, and this is effectively your management connection in the back door. 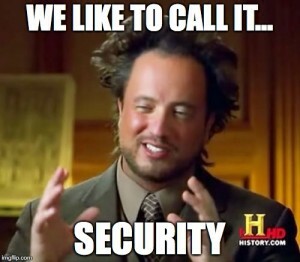 You might also potentially aggregate all of your security logs etc into the bastion VPC. This is like a neater version of Scenario A. Holy moly! Can you imagine trying to manage, support or troubleshoot this? 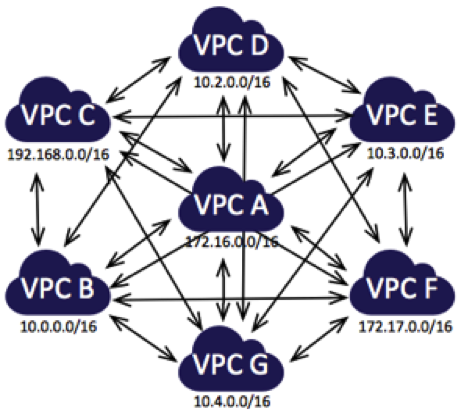 If you require this level of inter-VPC communication, then my first question would be why are you splitting the workloads across so many dependent VPCs, and where is the business benefit to doing so? Better to look at rationalising your architecture than try to maintain something like this. 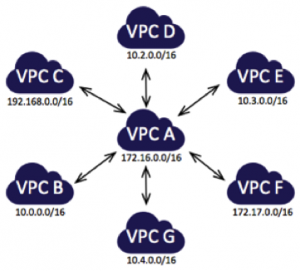 If you absolutely must allow every VPC to talk to most or even every other VPC, and the quantity of VPCs is significant then it may be worthwhile looking at something more scalable and easy to manage. This one is more scalable from a management perspective, but if I am honest, I am not massively keen on it! It feels a bit like AWS absolving themselves of all responsibility when it comes to designing and supporting more complex network configurations. It could potentially also work out rather expensive as you could end up needing a fairly hefty amount of Direct Connect bandwidth to support the potential quantity of traffic at this scale, as well as adding a load of unnecessary latency. 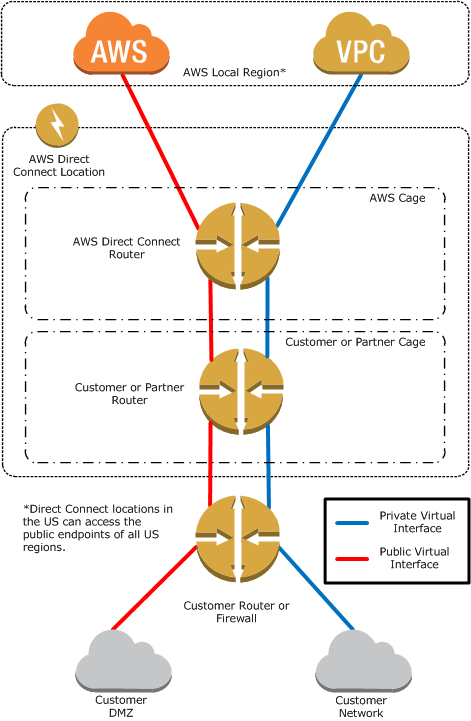 When you procure a direct connect, you are not procuring a connection to “AWS”, you are procuring a connection to a specific region. 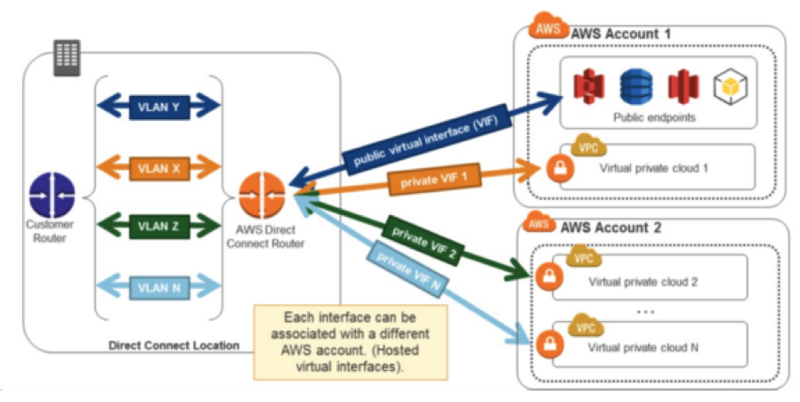 If you want to be connected to multiple AWS regions, you will need to procure connections to each region individually. To an extent I can see that this makes some logical sense. Let’s say they allowed access through one region to others, if you have connections to a single region and that region has a major issue, you could end up losing access to all regions. 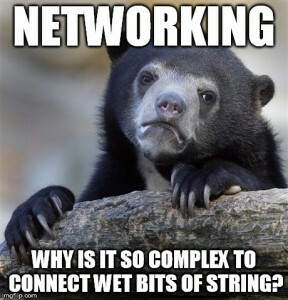 What would be good though would be the ability to connect to two regions, which would then provide you with region resilient access to the entire AWS network of regions. Whether this will become a reality is yet to be seen, but I have heard rumblings that there may be some movement on this in the future. As you can see, getting your VPC peering and Direct Connect working appropriately, especially at scale, is a bit of a minefield. I would suggest that if you are seriously looking at using Direct Connect, and need some guidance you could do worse than have a chat with your ISP, MSP or hosting provider of choice. They can help you to work out a solution which is best for your businesses requirements! Continuing in this series of blog posts taking a bit of a “warts and all” view of a few Amazon AWS features, below are a handful more tips and gotchas when designing and implementing solutions on Amazon AWS, specific to Direct Connect. If you have gone out and bought a shiny new Direct Connect to your AWS platform, you might reasonably assume that all of the users and applications on your MPLS will automatically start using this for accessing S3 content and other AWS endpoints. Unfortunately, this is not so simple! If you are not a giant enterprise and don’t need this kind of bandwidth, you can buy single VIFs from your preferred network provider, but you will pay for it on a per-VIF basis and as such multiple VPCs Direct Connect access to public endpoints will bump up your costs a bit. The question therefore becomes, what is the cost-effective and simple solution to access service endpoints (such as S3 in the examples below), when you also want to access your private resources in your own VPCs? This is not always a straight forward answer if you are on a tight budget. 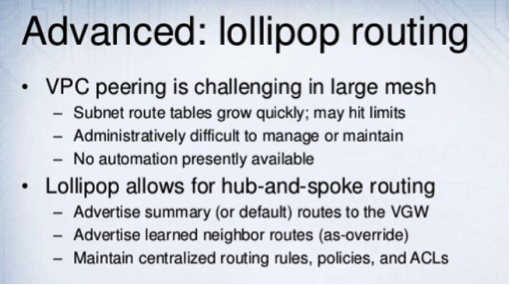 “Endpoint connections cannot be extended out of a VPC. 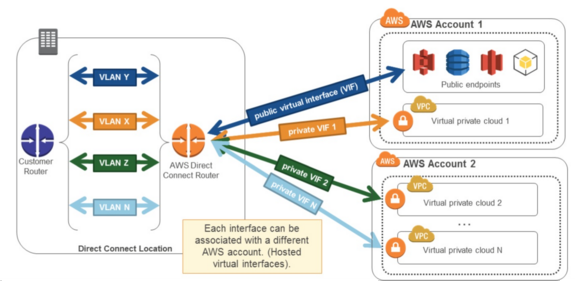 Resources on the other side of a VPN connection, a VPC peering connection, an AWS Direct Connect connection, or a ClassicLink connection in your VPC cannot use the endpoint to communicate with resources in the endpoint service”. Basically this means for every VPC you want to communicate with directly from your MPLS, you need another VIF, and hence another connection from your service provider. If you want to access S3 services and other AWS public endpoints directly, you will also need an additional connection dedicated to that. This assumes your requirements are not enough to justify buying a 1Gbps / 10Gbps pipe for your sole use, and are using a partner to deliver it. If you can buy 1Gbps or above then you can subdivide your pipe into multiple VIFs for little / no extra cost. Here are four example / potential solutions for different use cases, but they are definitely NOT all recommended or supported. This may come as a surprise to people, as you would expect to buy a connection and access any AWS service. 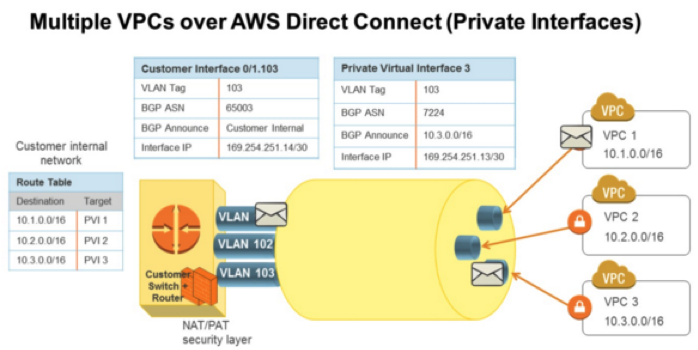 If you have a Direct Connect from your MPLS into Amazon as a Public connection / VIF you can then route to the content over your Direct Connect, however this means you are bypassing your VPC and going straight into Amazon. If you have a Direct Connect from your MPLS into Amazon as a Private connection / VIF, you could proxy the connectivity to S3 via an EC2 instance. The content is requested by your instance using the standard S3 API and forwarded back to your clients. This means your EC2 instance is now a bottleneck to your S3 storage, and if you want to avoid it becoming a SPoF, you need at least a couple of them. It is worth specifically noting that although technically possible, this method would be strictly against all support and recommendations from AWS! S3 Endpoints and VPC peers are for accessing content from your VPCs, they are NOT meant to be transitive. Lastly, Amazon’s primary recommended method is to run multiple VIFs, mixing both public and private. This biggest downside here is that each VIF will likely have a specific amount of bandwidth associated with it and you will have to procure multiple connections from your provider (unless you are big enough to need to buy a minimum of 1 Gbps!). As this scales to many accounts, many VPCs and many VIFs, things also start to get a bit complex when it comes to routing (especially if you want many or all of the VPCs in question to be able to route to eachother), and I will cover that in the next post. Continuing in this series of blog posts taking a bit of a “warts and all” view of a few Amazon AWS features, below are a handful more tips and gotchas when designing and implementing solutions on Amazon AWS, including AWS S3, Tags / Tagging as well as ASG (Auto-Scaling Groups). Individual S3 buckets are soft limited to 100 concurrent write transactions per second, and 300 reads initially and only partition as the storage performance quantities grow over time. This sounds like a lot but when you consider the average web page probably consists of 30-60 objects, it would not take a huge number of concurrent users hitting an application at the same time of day to start hitting limits on this. The first recommendation here, especially for read intensive workloads, is to cache the content from S3 using a service like CloudFront. This will immediately mean that for your object TTL you would only ever expect to see each object accessed a maximum of around 50 times (once per global edge location), assuming a global user base. A lot less than that if all of your users are in a small number of geographic regions. Third, effectively shard your data across multiple S3 buckets in some logical fashion, ensuring you are also roughly spreading the read and write requests equally between them, therefore increasing your maximum IO linearly with every additional S3 bucket. You would then potentially need some form of service to keep a track of where your content lives; a common method for this is to store the S3 object locations in a DynamoDB table for resilient and fast retrieval. 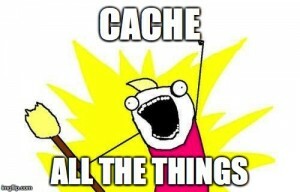 For extra fast retrieval you could also cache these S3 locations in memory using Elasticache (Memcached/Redis). If you go down this route and assuming older data is less frequently accessed, I suggest you rebalance your data when new S3 buckets are added, otherwise you risk having hot and cold buckets, which defeats the objective of sharing them in the first place! Even better, just start with a decent number of S3 buckets anyway, as the buckets themselves are free; you are only charged for the content stored inside them! This, of course, adds some complexity for management and maintenance, so make sure you account for this in your designs! If you are using Tags as a method to assign permissions to users or even prevent accidental deletion of content or objects (something I’m not 100% sure I’m convinced is bullet proof but hey! ), make sure you then deny the ability for users to modify those tags (duh!). For example, if you set a policy which states that any instance tagged with “PROD” may not be deleted without either MFA or elevated permissions, make sure you deny all ability for your users to edit said tags, otherwise they just need to change from PROD to BLAH and they can terminate the instance. This is a configuration point which can cost you a wee chunk of change if you make this error and don’t spot it quickly! When configuring your Auto-Scaling Group make sure the Grace Period is set sufficiently long to ensure your instances have time to start and complete all of their bootstrap scripts. If you don’t, the first time you start up your group it will boot an instance, start health checking it, decide the instance has failed, terminate that instance and boot a new one, start health checking it, decide the instance has failed, etc (ad infinitum). If your grace period is low this could mean spinning up as many as 60 or more instances in an hour, each with a minimum charge of an hour!Instead, work out your estimated Grace Period and consider adding an extra 20% wiggle room. Similarly, if your bootstrap script has a typo in it (as mine did in one test) which causes your health checks to fail, Auto-Scaling will keep terminating and instantiating new instances until you stop it. Make sure you have thoroughly tested your current bootstrap script prior to using it in an Auto-Scaling group! Update: One last point to highlight with this is some sound advice from James Kilby. Be aware as your environment changes that a sufficient grace period may be enough day one, but it might not be later on! Don’t set and forget this stuff, or you may find you come in one day with a big bill and a load of lost revenue when your site needed to scale up and couldn’t!